Just like you set a passcode for your iOS device, you can also set a passcode for the Google Drive app to make your files more secure. 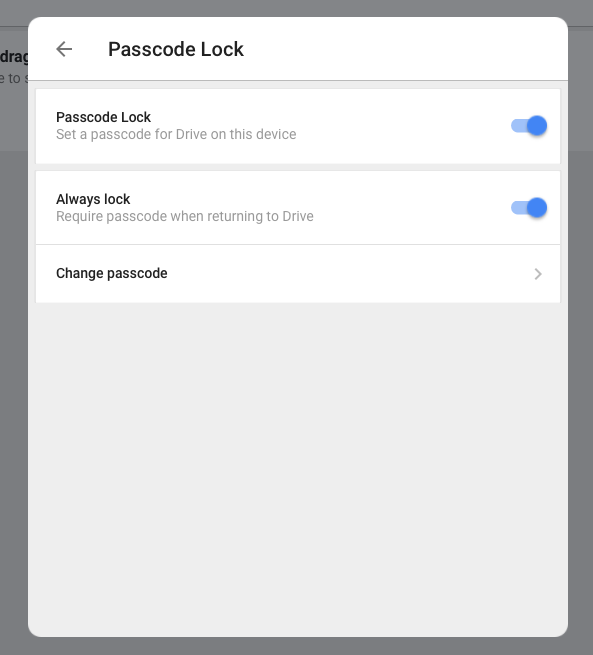 Unlike your device’s passcode which supports a four-digit numeric code, a custom numeric code, or a custom alphanumeric code, the Google Drive app supports only a four-digit passcode. But, this passcode feature isn’t supported for Android devices. Go to the Google Drive, Docs, Sheets or Slides app on your iOS device. Click “Passcode Lock,” then tap to turn it on and enter your four-digit passcode. If you wish to change your passcode, go to “Passcode Lock” by repeating the above steps and select “Change passcode”. To remove your passcode, go to “Passcode Lock” by repeating the above steps and tap “Passcode Lock” to turn it off. Note that you must enter your current passcode to enter the app after it is locked. If you enter a wrong passcode for five times, you can reset your passcode by removing the account. A display will prompt after your five failed passcode attemps, select “Remove Account.” Click “Manage” in the top-right to remove your account. Then, you need to re-add your account by again signing into the app. If you set a passcode via any of the apps— Google Drive, Docs, Sheets or Slides app, then all the apps will ask for the same passcode to use the app. In my iPhone, Google Drive doesnt allow me to put a passcode because, it tell me that "I have not already, protect my device with Settings > Touch ID & Passcode". I cannot properly understand what you are trying to say. Can you try again by following the steps mentioned above and see if the problem resolves?